Chelsea’s Premier League title win in Antonio Conte’s first season as a manager in England earned them almost £151m in prize cash, with official figures released today showing they have pocketed £150,811,183 from central funds alone. The money comes primarily from the PL’s huge TV deals but also includes Chelsea’s share of the league’s central commercial income. Manchester City were the second highest earners, making £146,927,965, followed by Liverpool (£146,122,439) then Tottenham (£145,461,325). 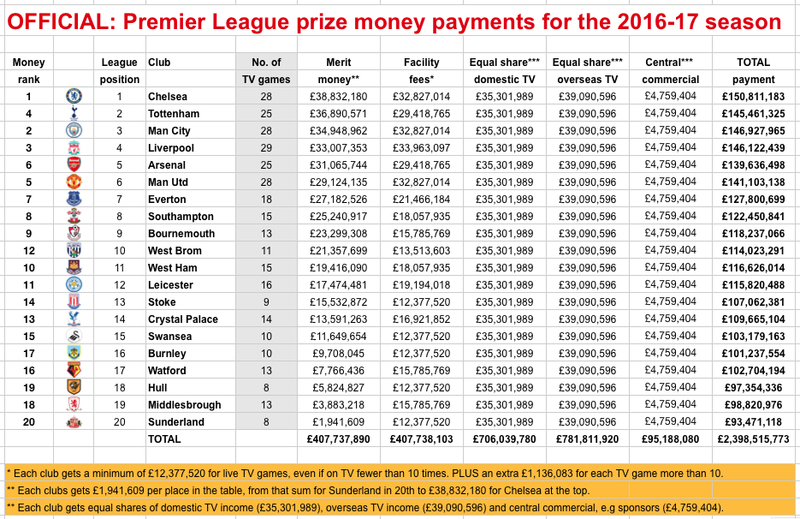 City and Liverpool both earned more than Tottenham despite finishing lower than Spurs in the table because they had more games shown live on TV in the UK – and more TV games means more money in the payments system. Manchester United, with £141m, were the only other club earning more than £140m although Arsenal came close on £139.6m. The lowest earning club, bottom of the table Sunderland, has to settle for ‘only’ £93,471,118. 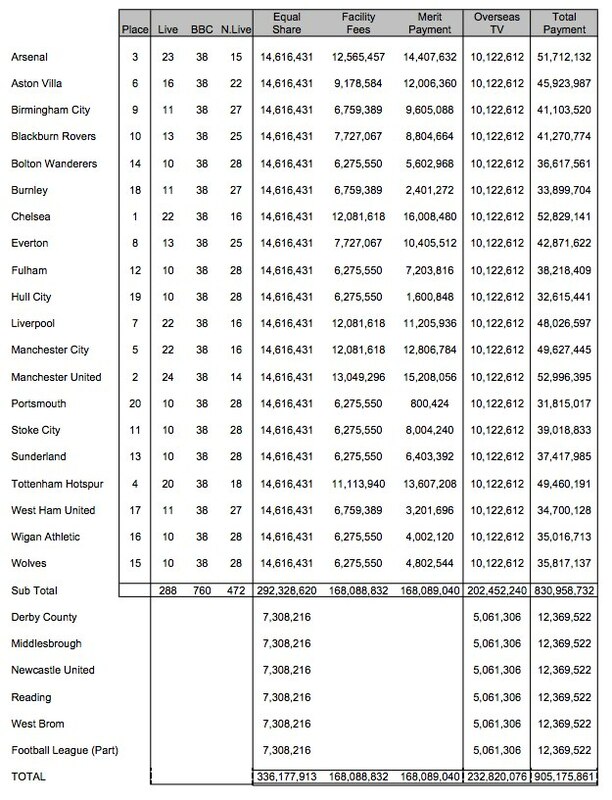 The 20 clubs between them have split a staggering £2.4 BILLION this season, from annual Premier League income that is now approaching £3bn a year, the vast majority from TV deals either at home or from overseas. The money is allocated in various ways, described in more detail below, but first, a summary graphic of who won what, to the nearest pound. Chelsea’s money was made up of £38,832,180 ‘merit’ cash for finishing top of the table, £32,827,014 in ‘facility fees’ for being shown in 28 live TV games in the UK, plus equal shares of the domestic TV deal, overseas TV deals and commercial income from the league’s sponsors. Sky and BT Sport are paying £5.136 billion between them to show Premier League matches live in the UK across three seasons from 2016 to 2019 inclusive. Foreign broadcasters around world are paying more than £3 billion combined, on top, for the same period. The Premier League also earns money from the sales of highlights (on Match of the Day), near-live rights, clip rights, and brings in further sums from commercial deals. All that cash goes into one big pot and the sums announced today are the eye-watering rewards for the clubs. For 2016-17 every club gets an ‘equal’ share of just over £79m derived from domestic TV income, overseas income and commercial income, with specifics in our accompanying table. Every club then gets another sum depending on league position, worth £1,941,609 per place in the table, from that sum for bottom-placed Sunderland to £38,832,180 to Chelsea. Each club also gets a variable amount depending on how many times they were shown live on Sky or BT. Every club got a minimum of £12,377,522 from this pot, even if they were shown as rarely as Sunderland and Watford (just eight live televised games each), or Stoke (nine times). Liverpool were shown live in the UK most, 29 times (a record for one club in one season), followed by Chelsea, Manchester United and Manchester City (28 times each), Tottenham and Arsenal (25 times each). Clubs have three main revenue streams: match day income (from tickets, corporate dining etcetera), media income (of which the payments listed are the largest but not the only part) and commercial income (from kit deals, sponsorship, merchandise, tours and so on). The ratio in central earnings between highest earners Chelsea at the top and Sunderland at the bottom in 2016-17 is 1.6135 to one. This is less ‘fair’ than last season’s all-time fairest ratio of 1.5153 to one between top and bottom. But the Premier League still remains by far the most equitable league in division of central funds in this regard. The difference between top and bottom is closer to 8 to 1, while in Italy’s Serie A it is 5 to 1, in France’s Ligue 1 it is about 3.5 to 1, and even in the German Bundesliga it is 2 to 1. 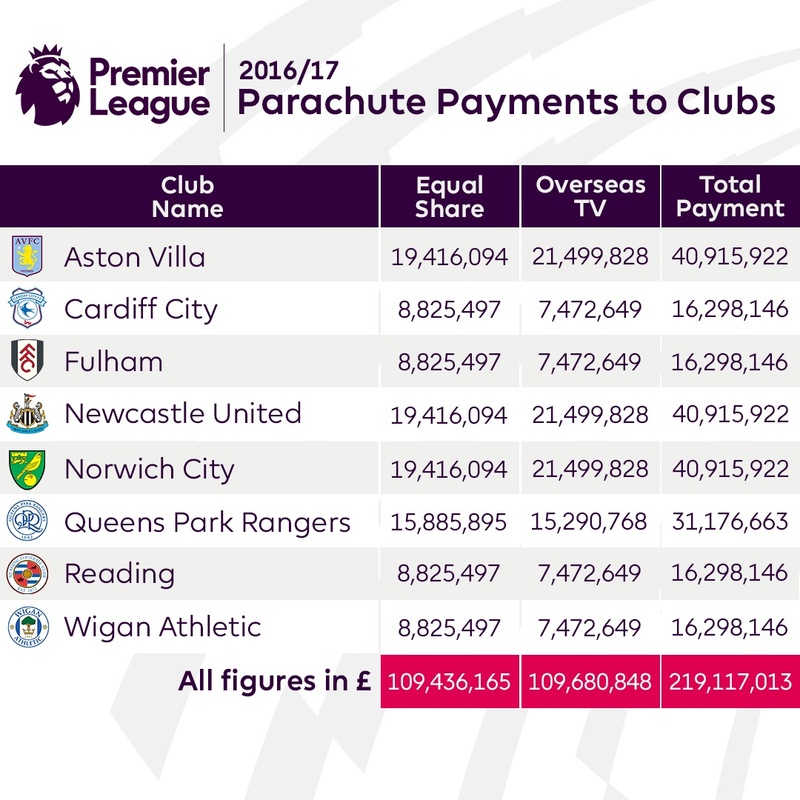 The Premier League pay ‘parachute’ payments to clubs relegated in recent seasons. The three clubs relegated last season – Newcastle, Norwich and Aston Villa – get £41m each this time. Full details are in the separate graphic below. When the Premier League was formed, the new governing body had a total income in 1992-93 of £45.7m, mostly from TV rights, and it paid out a total of £37.5m in prize money that year, including parachute payments to two clubs, Notts County and Luton, who to this day have still never played in the Premier League. (They missed out on the new era by getting relegated in the final season of the old First Division). Manchester United were top earners from central funds back in 1992-93, making £2,413,660. Middlesbrough, the lowest earners, made £1,063,135.